Air, as we all know, is clear, and just as with water, this clarity probably makes you feel intuitively that it is clean and safe, as any potential pollutants are invisible to the naked eye and thus out of sight and out of mind. But is there cause for concern regarding the air in your home, after all? Each person inhales over 3,500 gallons of air each day. With the amount of time people now spend indoors, most of that is indoor air. You’d think that makes it mostly okay, wouldn’t you? Indoor air is clean, having cycled through your house’s air system, whereas outdoor air is dirty, filled with smog and allergens, right? Wrong. Indoor air can contain 100 times as many pollutants as outdoor air, sometimes more than 30 million in a single cubic foot. A single ounce of dust in your home can attract 40,000 dust mites, and a person sheds up to 700,000 skin flakes per day. If that makes you feel grossed out, it should, because you deserve better. Especially when you take into account the impact this can have on your family’s health. Polluted air causes 94% of all respiratory problems. Of those problems, one of the biggest risks you face is the development of asthma. More than 31 million Americans have been diagnosed with asthma, and about a third of those are children under 18. Allergies are another risk factor, as an estimated 10-15% of the entire population may be allergic to cat or dog dander, and a poor air circulation system means these allergens are trapped in your air. So, what’s the solution to all of this? We advise a whole-house air cleaner, and of all the brands of air cleaners on the market, Aprilaire is the one we most strongly recommend. One of the most popular models we install is the Aprilaire media air cleaner, formerly called the Space-Gard. This powerful air cleaner traps 98% of visible airborne dust and other large particles, and at least 97% of airborne pollen-sized particles. 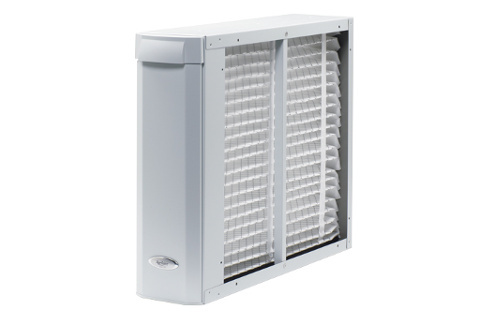 It accomplishes this by providing 30 times the filtering media compared to standard 1″ furnace filters. The Aprilaire Media Air Cleaner is low-maintenance too—it requires only the infrequent replacement of filtering media every 1-2 years, so for the most part you can set it and forget it. This, however, is our highest-performance model. The Aprilaire Model 5000 Whole-Home Electronic Air Cleaner has been rated “number one” three years running by the leading products ratings magazine, and for good reason. It electronically charges particles and traps them like a magnet better than any other air cleaner. This lets it accomplish some very impressive things. It traps 99% of airborne pollen, mold and spore-sized particles, 98% of airborne bacteria-sized particles, and 94% of respirable dust, which the EPA reports can trigger asthma. In addition, it captures 80% of airborne particles the size of tobacco smoke, and removes up to 80% of airborne virus-sized particles—something no other air cleaner in the industry can do! The Model 5000 is easy to maintain, too. Unlike competitive electronic air cleaners there is never a need for the frequent and time-consuming cleaning or washing of collector cells. The Model 5000 simply requires infrequent replacement of filtering media and wiping down of ionizing wires—a task that takes less than 20 minutes. The Model 5000 is tried and true, and it’s your best bet for delivering the highest efficiency possible. If you’re satisfied with your air cleaner and simply need filters changed, we sell air purifier and air cleaner filters for a wide range of products at our office in Loves Park, IL. 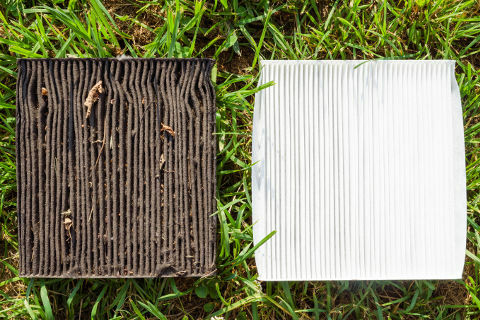 You can call ahead to check if we have filters for your model in stock, or we can also simply change your specialty air filters for you during your routine maintenance visit for your furnace or air conditioner. Whatever your air filtration needs, we’ve got what you need.